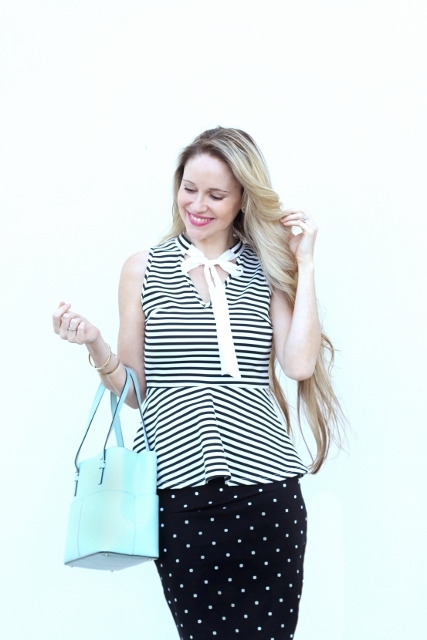 Today I'm featuring this pattern-mixed peplum look. Another peplum, you ask? I know, I know. 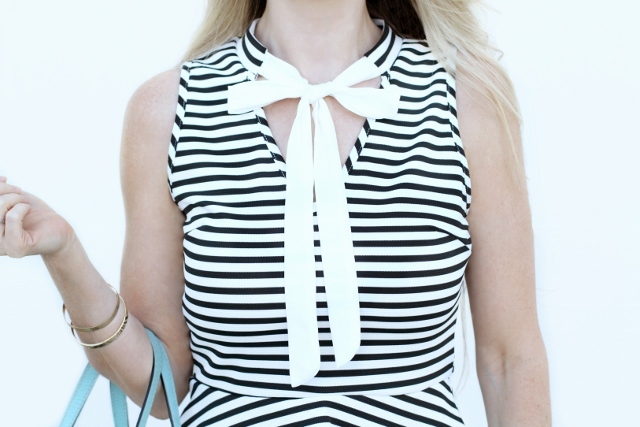 But it's a striped peplum with a tie-neck collar! Need I say more? The contrasting, white, chiffon-like ribbon at the collar is so darling! It's actually what sold me on this one. Plus, the price was right at only $26.80! I took a chance on it since it's from a brand I'm unfamiliar with, and there were no online reviews, sizing references, or other details to go by; that said, I don't regret it one bit! It's just adorable! The brand name is "MustHave." Very apropos, right? I recently wore this top to dinner with a few girlfriends, and they immediately began interrogating me (in the best way) on where I got it, the price, size, etc. It's always a good sign when your outfit is a conversation-starter! Since it was going to be a fun night out, I opted for a little pattern play with my outfit in a classic black-and-white color palette, pairing the striped peplum top with a polka-dotted pencil skirt. I've had this skirt for several years; it was one of those unexpected finds at Old Navy, and I'm so glad I snagged it when I did. I've worn it countless times! To infuse some color, I finished the look with my trusty Kate Spade aqua tote and my favorite J.Crew bubble gum-pink suede pumps. The overall look was everything I had in mind: feminine, pretty, and slightly whimsical. 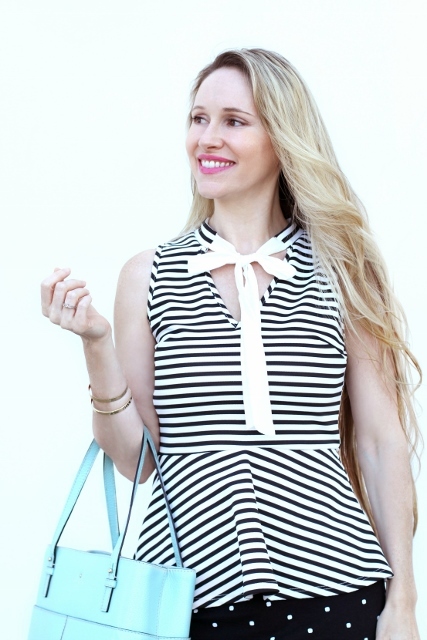 If you love peplum tops as much as I do, you need this one in your closet! It's highly versatile, pairing well with everything from skinny jeans, dress pants, or pencil skirts. I highly recommend it! To transition it for Fall, I plan to pair it with more rich, autumnal hues like mustard, camel, and bordeaux. I already have these wool pencil skirts in mind; they're longtime favorites of mine, and very high-quality. What are your favorite pieces for girls' night out? Do you like a little pattern-mixing?